"Pear applesauce? Papplesauce? Appearsauce? When the apple-pear sauce is served warm, you will not need any additional sugar. As it cools it loses some of the natural sweetness, and you might want to add sugar to taste." Heat a skillet over medium heat; add pears, apples, water, and vanilla extract to the hot skillet. Cover and simmer fruit mixture for 10 minutes; remove lid and cook until most of liquid is evaporated and fruit is softened, 10 to 15 more minutes. Remove skillet from heat and transfer fruit mixture and any remaining liquid to a food processor. Process until smooth; stir in cinnamon. Serve warm or refrigerate up to 4 days. I added cinnamon to taste and a bit of lime juice for punch. Perfect for all of us. I peeled them and did the overnight crockpot idea! My children loved it!! yummy I love bananas, so I added one banana and the flavor really came through. 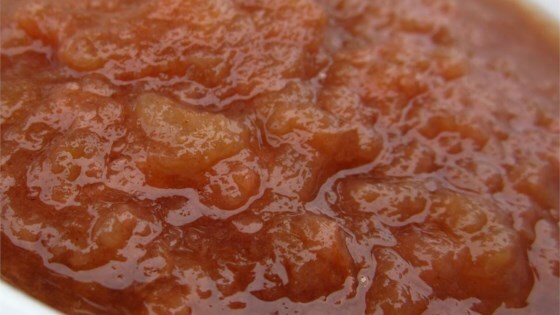 Homemade applesauce is much, much better than store purchased. My house smelled absolutely amazing as this sauce simmered on the stove.So easy and economical when apples and pears are in season! Super easy to make, and absolutely delicious. I didn't process it though, just mashed it manually because we like a chunkier sauce. Delicious and not too sugary. I ended up just mashing up the apples and pears instead of running through a processor and it worked out great.